While the newer generation may consider themselves to be tech-savvy, contrary to popular belief, the older generation also isn’t far behind. Since the youngsters inherited smart devices they often ignore the fact that their peers were the ones who witnessed the massive shift in technology. From analog cash payment machines, to digital sensor card readers which take payments with one swipe. The older ones have seen a laundry list of appliances and objects get condensed into one single gadget, i.e. the Smartphone! Wishing for swanky offices and modular kitchens, we moved bag and baggage to new cities away from our humble country homes and most importantly, our Parents! We promised them everyday calls, which soon changed to weekly calls or occasional ones during anniversaries and festivals. With advent of technology, we have even substituted our visits to them by making video calls. Their eyesight may not be as good and their hands may shake typing a simple ‘Happy Birthday’, but you bet their mind is just as sharp. They have adapted to more technological advancements in their prime than you. To help them adapt to their physical limitations, few kind souls have created apps specifically catering to their needs. Let’s have a look at their inventions down below. 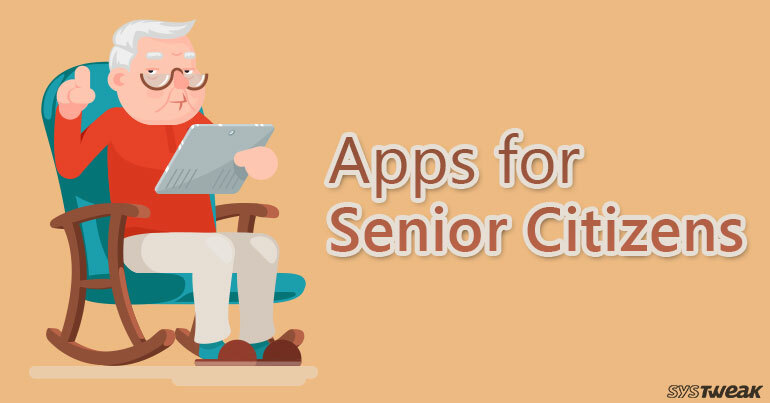 The number 1 app for senior citizens on Google play. It features eyesight friendly bold text and big sized icons. It has a simple user interface. This app compromises key features of senior specific phones + smart phones and offers a unique functionality which can be easily used by Parkinson patients. Compatibility with Android Jelly Bean and above. Even if you can’t be a constant companion with the elders of your family, you can help them even from a long distance. Wiser has a colorful and enlarged interface. It is easy to navigate and a novel sister app, named ‘Wiser Companion’ one can remotely customize and personalize a Wiser enabled phone. It is easily compatible on Android with Ice Cream Sandwich and above. For Grandparents who are on the go, Waze offers easy navigation and even pins down the exact spot where a car has been parked. This app even drives through Android Auto and can be displayed in your car screen. With a solid data pack, this app updates real time traffic and arrives at the destination in the shortest route possible. The compatibility of this app varies on different Android phones. Keep Alzheimers at bay with this mind engaging app which challenges one’s memory and attention. Available in 6 languages, Lumosity boosts mental skills. Its Android compatibility varies from device to device but as a free app, this one tick marks all our boxes. This one is a must for that sweet toothed Grandma. She used to be the best baker in her generation but now hides candies in her clutch. Calorie counter scans barcodes to get a better idea of the calories in a ready to eat snack. It also has a huge database of 6+ global food items and cuisines. No more mentally wondering how much calorie you packed when she polished off that Sushi plate. The answer is right there in the app! The Android compatibility may vary from device to device but rest assured, this app is a must for your loved ones phone. While we may update our parents’ phones with the most user-friendly apps, nothing can compare spending time with them. The uncertainty that is life, every day and every moment with them needs to be cherished. No app can replace a road trip with them. No app can take the place of learning a family recipe in the family kitchen, surrounded with laughter of our own kids and proud smiles on our parents faces. Take a break, unwind. Soon we may be left with just memories.